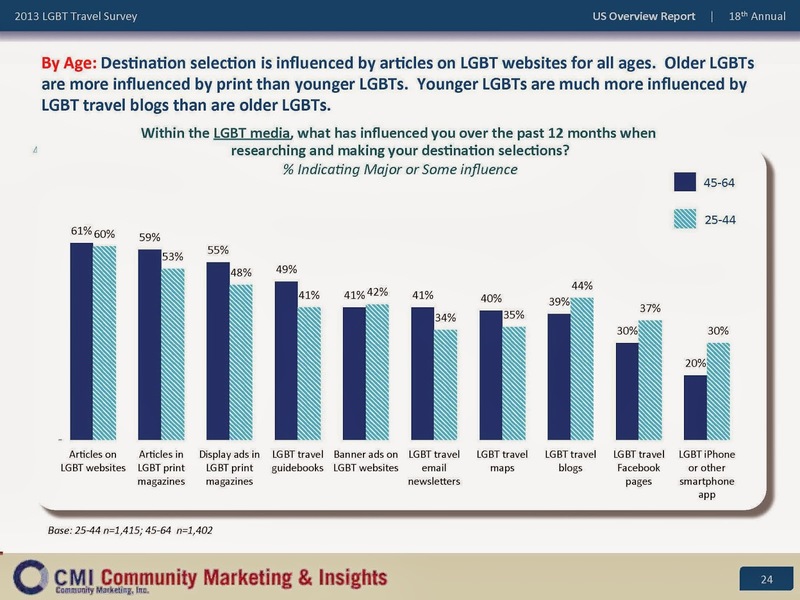 After having attended the CMI Tourism and Hospitality Conference in Fort Lauderdale recently, one of their research takeaways was that the #1 source for influencing gay & lesbian travel destinations was written articles, both online and in print. This spanned many demographics including both gay men and lesbians, as well as both the older LGBT population and LGBT Millennials. 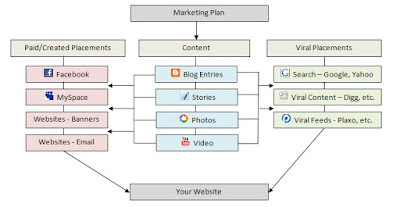 It has been proven once again with this research that a strategic, cutting-edge marketing mix starts with innovative and original content (including articles, blog entries, photos with text, etc.). Both online and print advertising propels this message forward, with email and mobile marketing rounding out the top ten in this study. 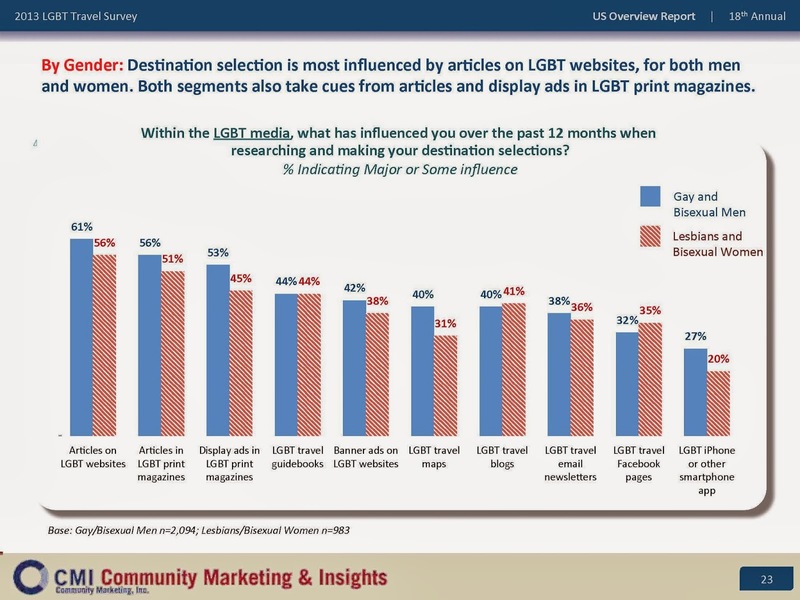 Thus, the best strategic direction to remain relevant in the LGBT “mindshare” is to include these marketing mix elements with content taking the lead. When writing content, we recommend shying away from advertorials. Actual articles written by qualified and proven LGBT journalists are more valuable. These journalists have considerable experience writing from LGBT publications and websites and give a strong legitimacy to the content. So where do we go from here? We are extremely excited to take this model global in 2014, teaming up with key LGBT media partners to bring these Interpersonal Marketing techniques and strategies to a wider audience. These are LGBT media partners with a strong interactive presence, whether through websites or social media. We pride ourselves on working with media partners who really understand that 360-degree marketing and Interpersonal Marketing are one and the same. These people and entities use content as the cornerstone of an effective marketing campaign and they produce real results for companies wishing to stay ahead of the pack. They have a mobile presence, databases of consumers and have evolved with the ever-changing landscape of digital media. They will be instrumental in positioning our clients ahead of their competitors in 2014. Stay tuned for our upcoming announcements! We will be naming our partners that will help us expand our marketing and client services reach to the various LGBT niches such as lesbians, local / regional, and LGBT people interested in travel, sports and more. Thanks for sharing a very interesting article about Pink Banana Media Growth and Trends for 2014. This is very useful information for online blog review readers. Keep it up such a nice posting like this.